Lichenfan sculpture is 3D printed by Shapeways in their 'sandstone' material, a gypsum based, very rigid, hard material that feels similar to sandstone. It can be used as table top lighting with an L.E.D candle (battery powered candle). The LED candle is not included. 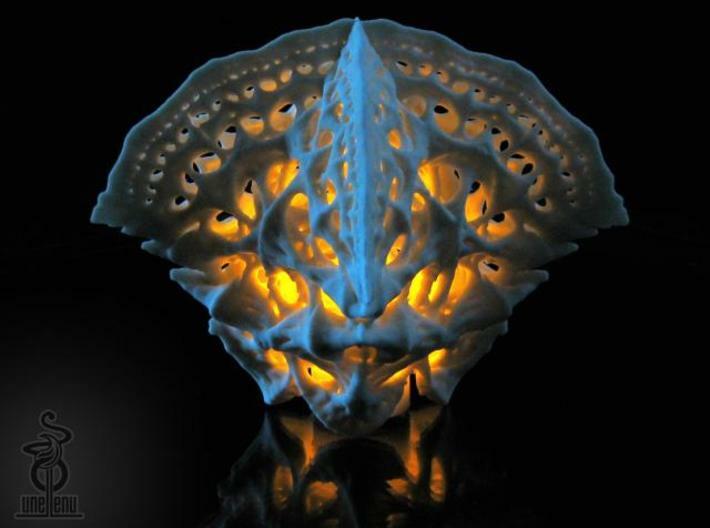 Shapeways 3D prints and ships the light shade / sculpture part only. Care instructions:The material can break if dropped on hard surfaces, handle it as you would a precious ceramic object. SAFETY NOTE: Not suitable for use with real candles. This design can also be used as a lamp shade (extra parts required). Add some 3D printed elegance to your table. View a gallery of images of this design on the unellenu website.